Has anyone that you’ve known in your life made an everlasting impression on you to the point that you realize that person COULD be a Superhero??? 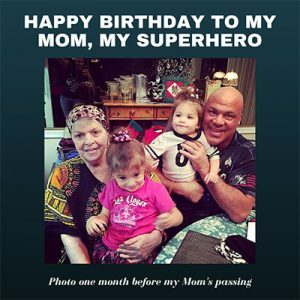 Today is my mother’s birthday, she died of cancer last year. My mother was MY superhero. She was the toughest, strongest, most loving and compassionate person I’ve ever known. My mom was a tremendous mother, sister, grandmother, great grandmother, and great great grandmother. She suffered dearly and it hurt so badly to see her in so much pain. She refused to take any pain medication because she told me “GOD never gives you more than you can bear”. That was my mom, the rock of the family. She always kept the family together and the sh#t we put her through was so overwhelming, I don’t know how she survived all of the turmoil, but she did. She always seemed to have it together for us, even when she couldn’t handle the situations we (her kids) put her through, she certainly acted like nothing was bothering her. She was a leader and quickly picked up the slack during the hardest points in our lives. My mother did it all, when my father passed away when I was 15 years old, she had to go out to get a job to support the family. She continued to be our rock when my grandmother died and when my sister died. She was the strongest human being I’ve ever known. I only saw her cry two times, after I won my olympic gold medal and after my sister died from an overdose. Don’t get me wrong, my mother wasn’t a machine. She was very much human but she kept her feelings in check so that she could be strong for all of us. I loved my mother so much that I married my beautiful wife Giovanna because she has the exact same quality traits as my mother. It’s a tremendous thing when your biggest influence passes away and you’re married to the one that reminds you most of them. I just want to say today on January 7th…Thank you for everything Mom and Happy Birthday. I miss you dearly and I love you with all of my heart. You have made an everlasting impression on me. I only hope that I can be half of the human being that you were. Thank you!!! !